This leaf with its stirring portrait of Louis XII would originally have opened a lavish book of hours court artist Jean Bourdichon painted for him. The depiction of the king in his parade armor probably celebrates his recent coronation in 1498, and reflects an official image of the new king. 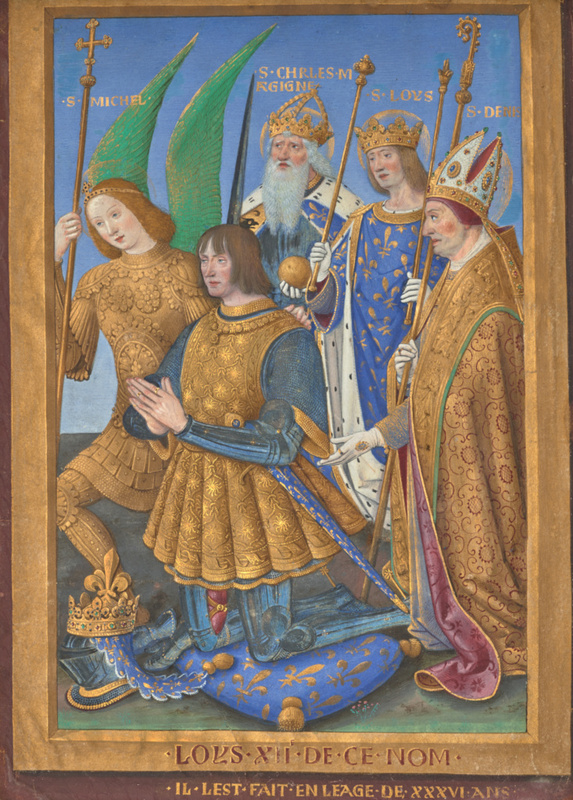 Louis is presented (from left to right) by a number of royal saints: Saint Michael, the patron saint of the royal chivalric order; Saint Charlemagne, from whom the French kings traced their descent; Saint Louis of France, the king's namesake and his forebear on the throne; and Saint Denis, the patron of the French royal household. The finely observed portrait of Louis XII shows Bourdichon at the height of his artistic powers. The Hours of Louis XII was one of the greatest French manuscripts of its time. Only sixteen of the manuscript's original complement of miniatures have come to light, and the Getty has acquired three of them. The other two are an image of the Presentation in the Temple, and a depiction of Bathsheba bathing.